Although I was raised in Michigan, I became aware of Kansas at an early age. 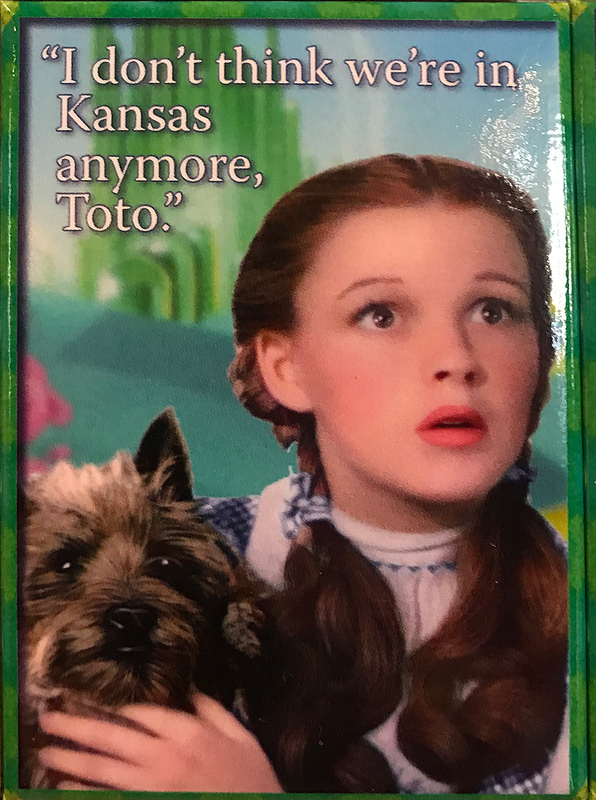 Dorothy and her faithful dog Toto gave me an early introduction to Kansas, including it’s tornadoes – you know the ones – the terrifying twisty storms which served as portals to a far off land full of witches and wizards and other strange denizens. The 1939 film The Wizard of Oz etched the name “Kansas” indelibly in my memory. I have a feeling I am not alone in that regard. But little did I know at the time that some day, I too, would reside in Kansas. Such is the strange stuff of life as they say. While I’m not an actual native of Kansas, I’ve resided here long enough to call it home. I’ve traveled the state from end to end and I’ve previously photographed and written about many interesting things that I’ve seen and discovered. (In case you are curious click HERE for a sampling of articles.) But it was only recently that my path took me to the small community of Wamego, Kansas. It’s located about forty miles west of Topeka, Kansas on Interstate 70 and then another 10 miles or so north on Kansas Highway 99. (Yes, dear travelers – to visit Wamego you must get off the Interstate – deal with it.) It seems that in 2003 the Kansas Legislature designated this particular 10 mile stretch of Kansas 99 as the “Road To Oz,” which is only fitting. 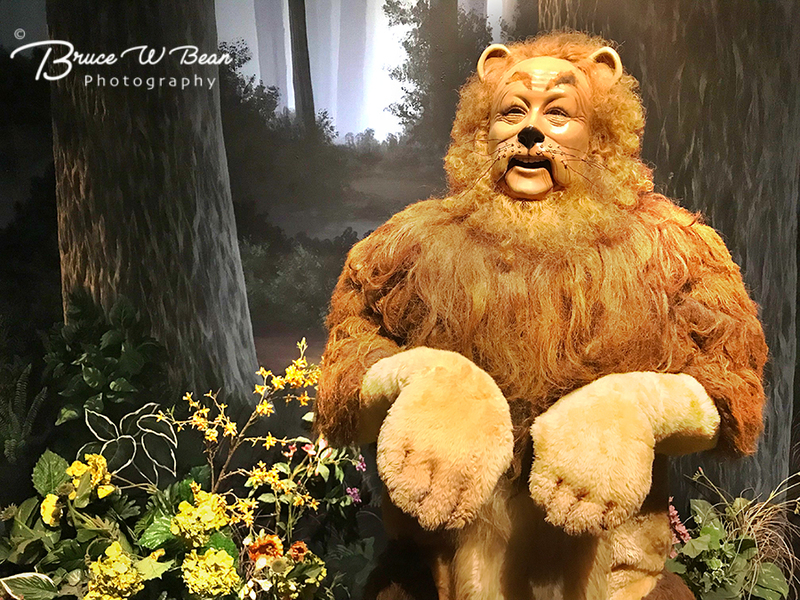 You see, Wamego is where I encountered Many Things Oz – including The Oz Museum, The Yellow Brick Road, Multiple Totos including Toto’s Tacoz, and even The Oz Winery. Seems like in Kansas, Wamego is Oz Central. So where did this all come from? I’m not clear on the exact details, but several residents of Wamego reported to me that their city’s connection with The Land of Oz started with a resident’s collection of Oz Memorabilia. The collection grew and grew until it was – well – noteworthy. Beyond that, the story is less clear but it seems that eventually the collection evolved into the basis and core of what became The Oz Museum. 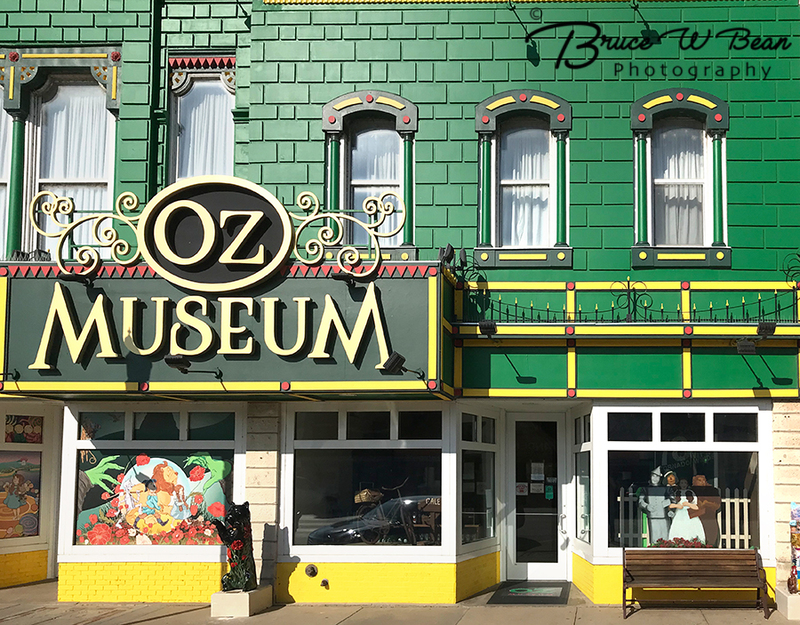 The Oz Museum is the central Oz feature in Wamego. 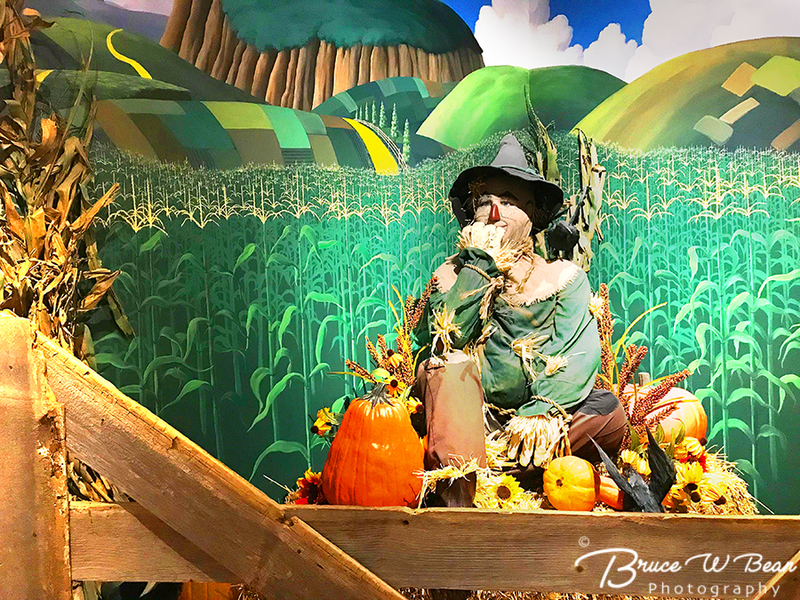 Over the years, with the success and experience of the museum, it seems that others began to build on the theme of Oz in the City of Wamego. And the rest is, as they say, history. I arrived in Wamego in the mid-morning accompanied by a sense of excitement and a bit of hunger as well. My first agenda therefore was to find a good breakfast. I am happy to report I was successful. Friendship House is both a restaurant and bakery. It is housed – quite literally – in a fine old house on Ash Street facing Wamego City Park. 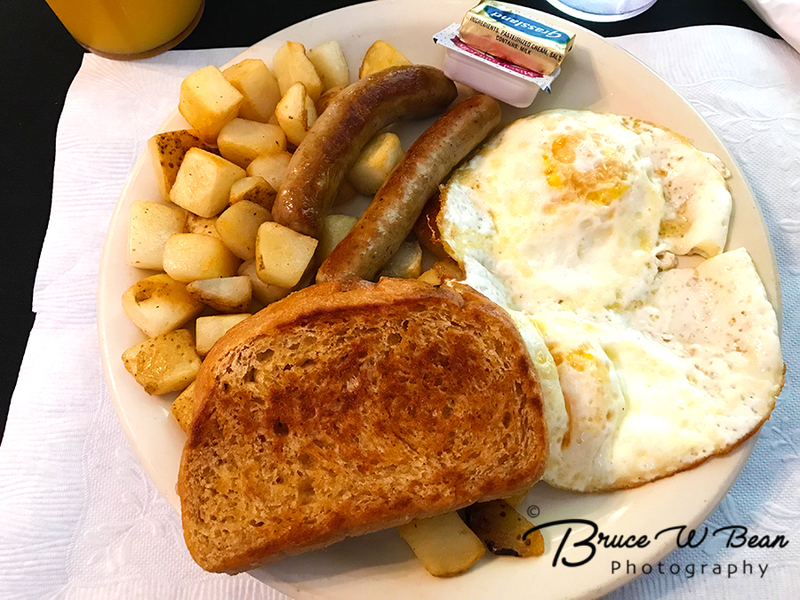 The front of the house functions as the restaurant’s dining area, seating around 70 patrons, and serving home cooked breakfast and lunch. The bakery operates out of the back of the home. I went with the full traditional breakfast. It was delicious and filling. The restaurant’s dining area in the front room of the home is very pleasant. It is furnished in a fashion in keeping with the home style cooking and the location is a nicely appointed home. 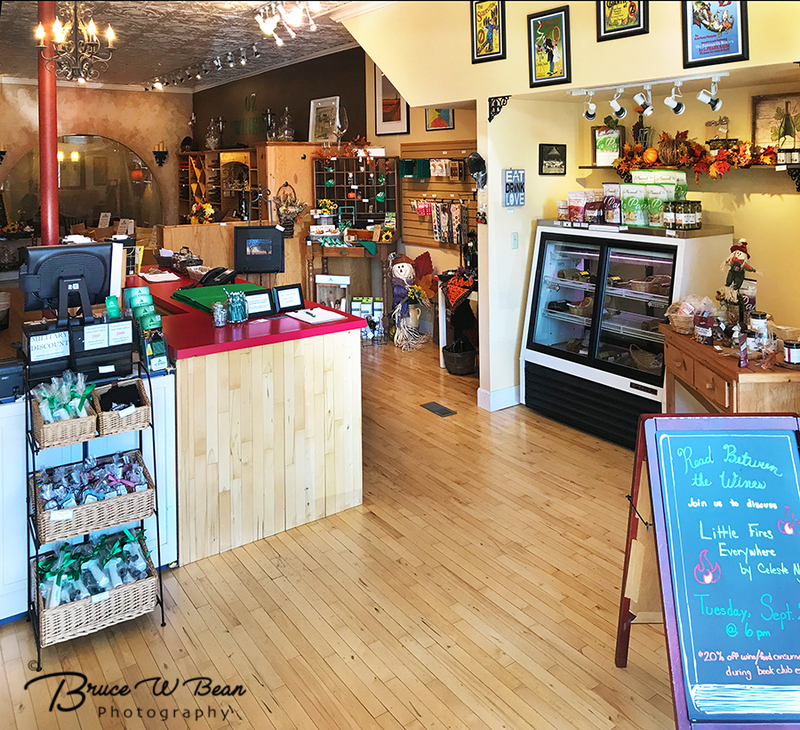 The staff is delightful, attentive and very helpful – and they are very pleased and happy to talk about their town, it’s features, and it’s history. After a fine country breakfast at the Friendship House I set out to explore the Oz Side of Wamego. I didn’t have to go far. Immediately outside the restaurant I encountered a road – actually a yellow road – you know, as in The Yellow Brick Road. No-one had to tell me what to do – I’ve seen the movie for gosh sakes. Dutifully I did as the mantra directs – I followed the Yellow Brick Road. 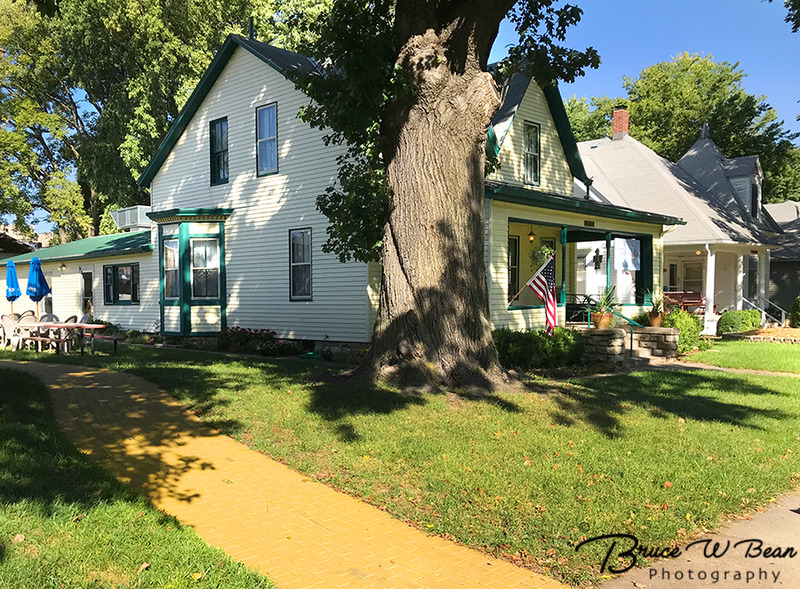 The Yellow Brick Road wandered a short way through a shady lane and ended up on Wamego’s main street. ( And yes, that is an emerald green statue of Toto on the left – more on that later.) After emerging on the main street I wandered about a bit in pursuit of anything Oz or Oz-like. It was time to explore. My journey of exploration continued along the main street of Wamego. It wasn’t long before I encountered The Oz Winery. It’s right on the western side of the main street. It’s painted a distinctive bright green. 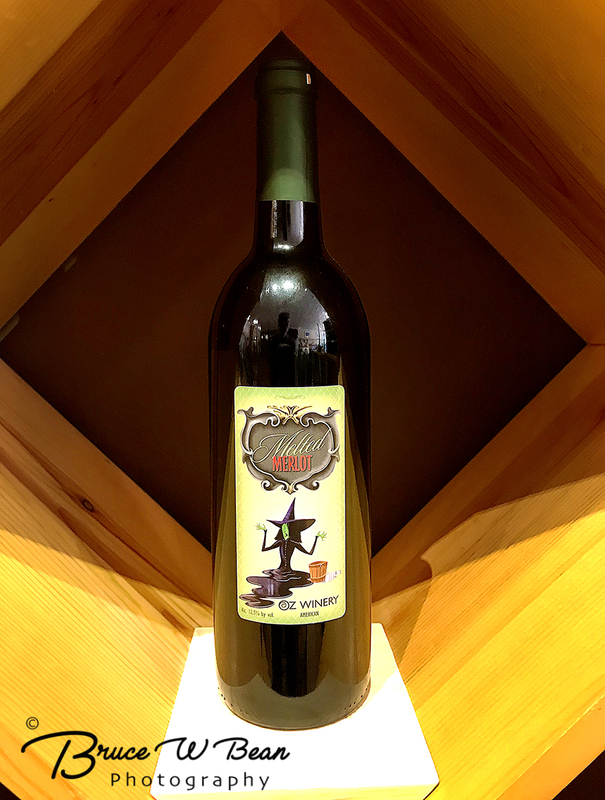 The Oz Winery offers a variety of items and most of them seem to be related to the Oz theme – go figure. Not surprisingly you will find wine lots of wine for sale. But the winery also offers other Oz and Kansas themed products such as clothing (Think T-Shirts, hats, etc. ), glassware and wine accessories. In addition they offer cheeses, Kansas made jams, chocolates and even a few cigars. 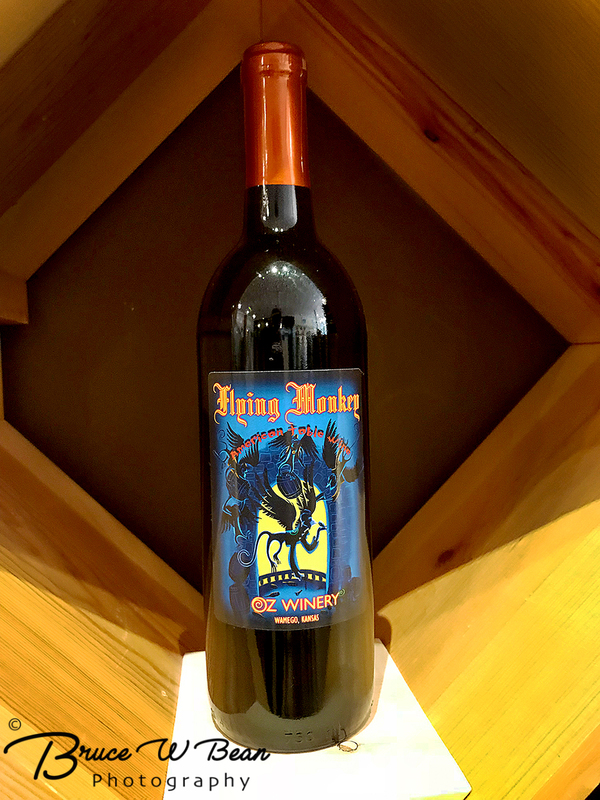 The wines offered by theOz Winery are truly distinctive – especially in terms of their names and labels. 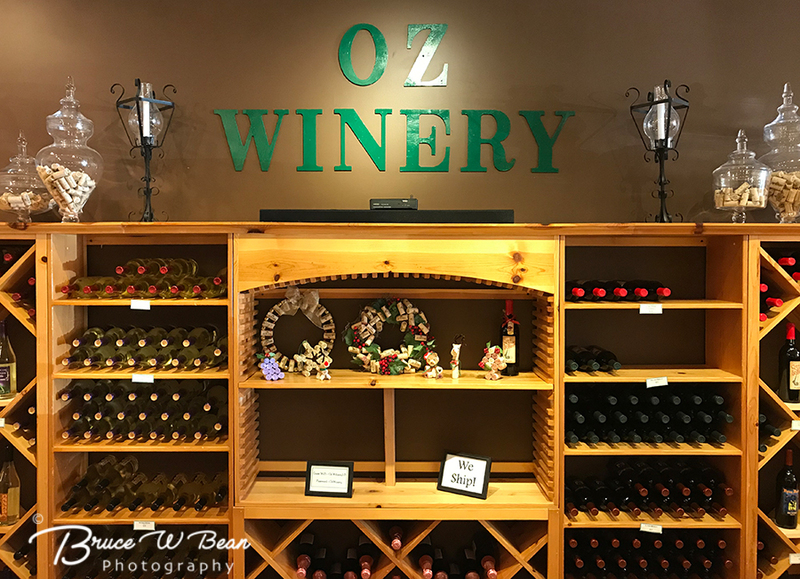 The Oz Winery offers a variety of tastings of their wines or, if you really want to do some serious sampling, you can purchase wine flights. It was still morning when I visited and I had just completed a large breakfast so I limited my sampling to a small taste of Flying Monkey. It was really quite good – but I am mostly enchanted by the name and label. 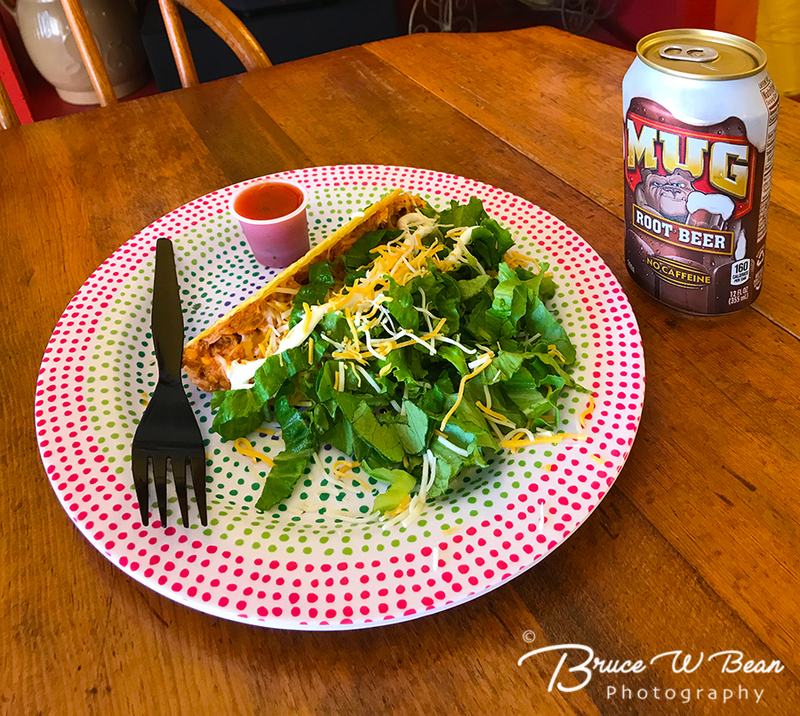 Amply satisfied with a fine breakfast and a wee taste Oz wine, I continued my explorations in search of Wamegos’s main attraction – The Oz Museum. Wamego is not a large town so it was just a short walk north from the winery to the museum’s front door. You can’t miss it. 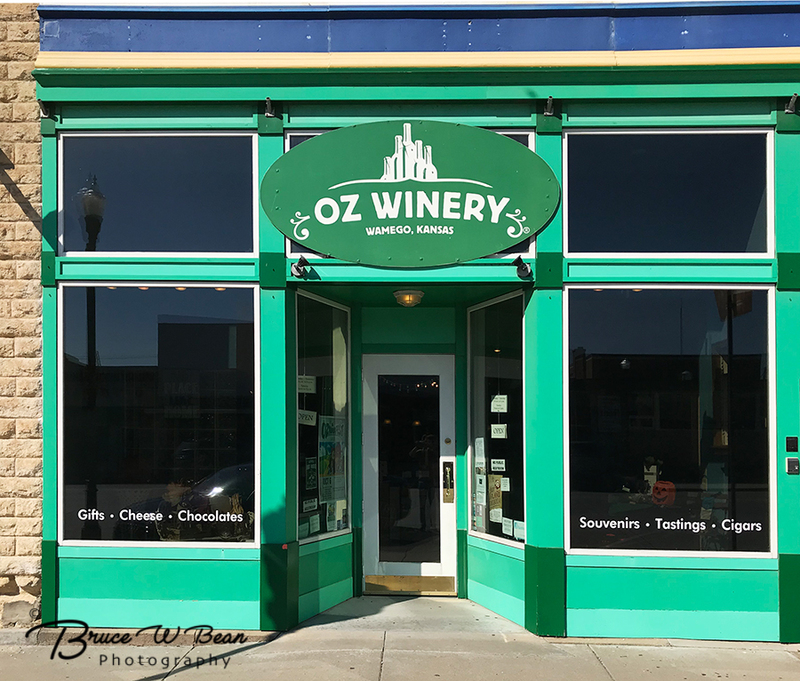 It is located toward the northern end of the store fronts which line the main north / south street of Wamego – Kansas 99 – aka The Road To Oz. The museum tends to stand out with it’s brightly painted green and yellow facade on west side of the street. 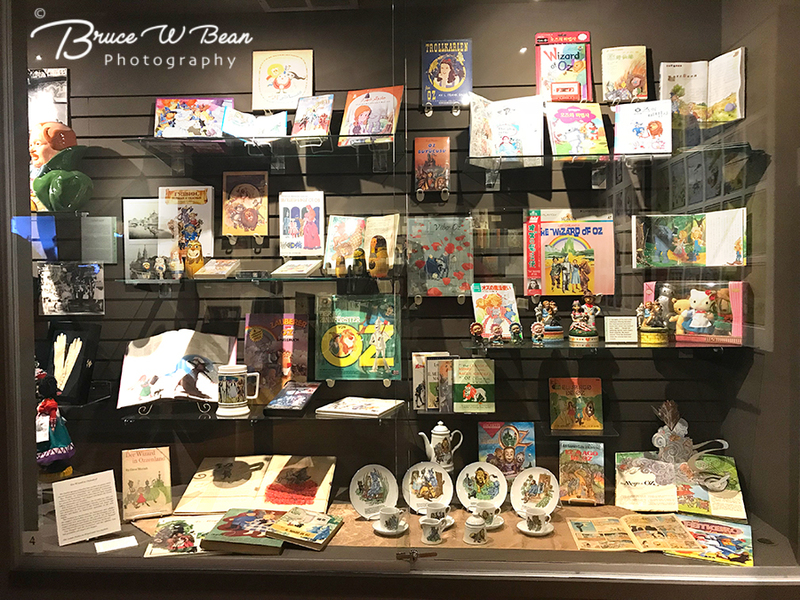 The Oz Museum is full of all sorts of stuff related to The Wizard of Oz, The Land of Oz and really Anything Oz. There’s old stuff, memorabilia, Oz tableaus, and yes – of course – a well stocked Oz gift shop. It’s all really well done in a quirky sort of way and an interesting experience, especially for anyone with a love of Oz. 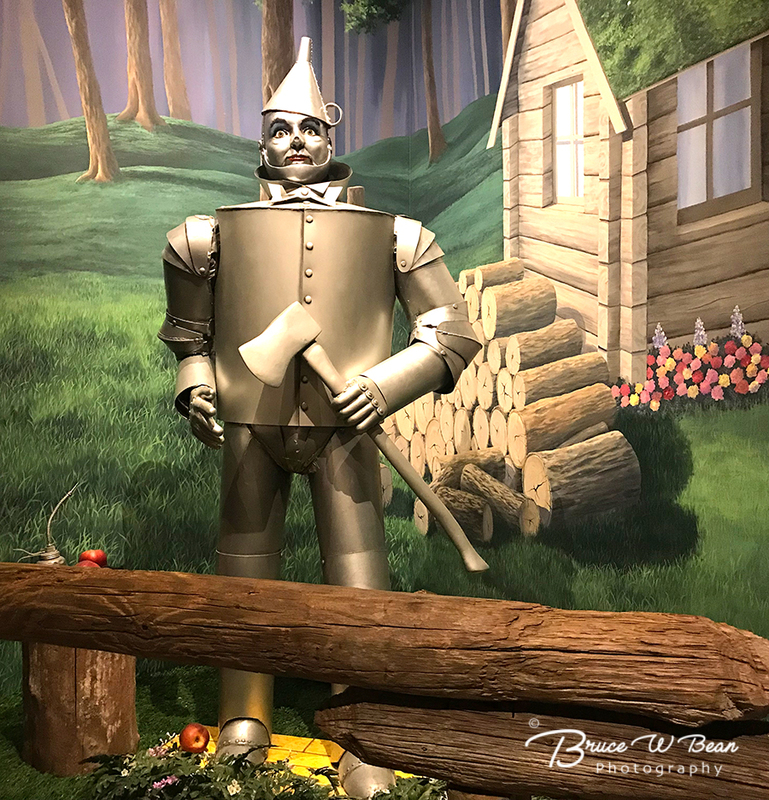 As I explored the exhibits I was whisked back to my childhood images of Kansas, complete with Dorothy and Toto, her faithful companions – The Scarecrow, The Tin Man, and The Lion – and the strange locations and destinations including Dorothy’s Kansas farm home, The Land of Oz, and The Emerald City. 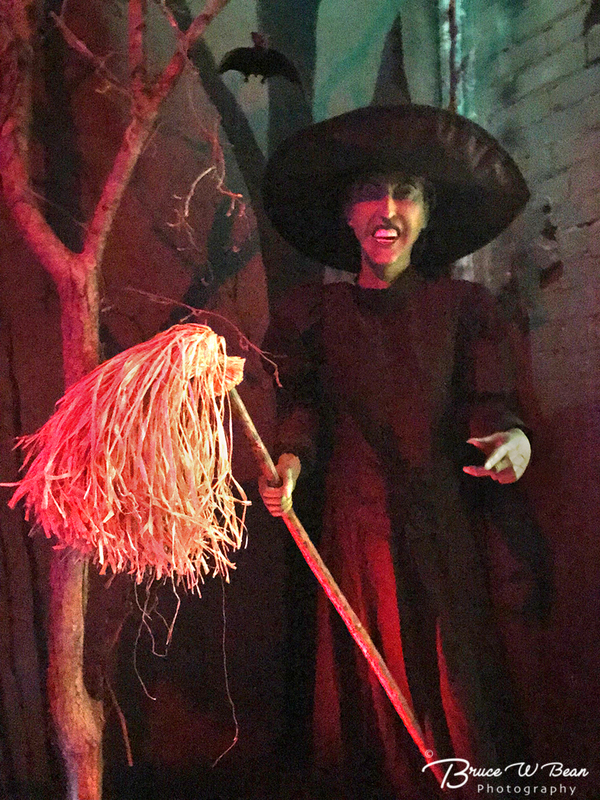 As you wander through the exhibits in The Oz Museum you too will meet some old friends. 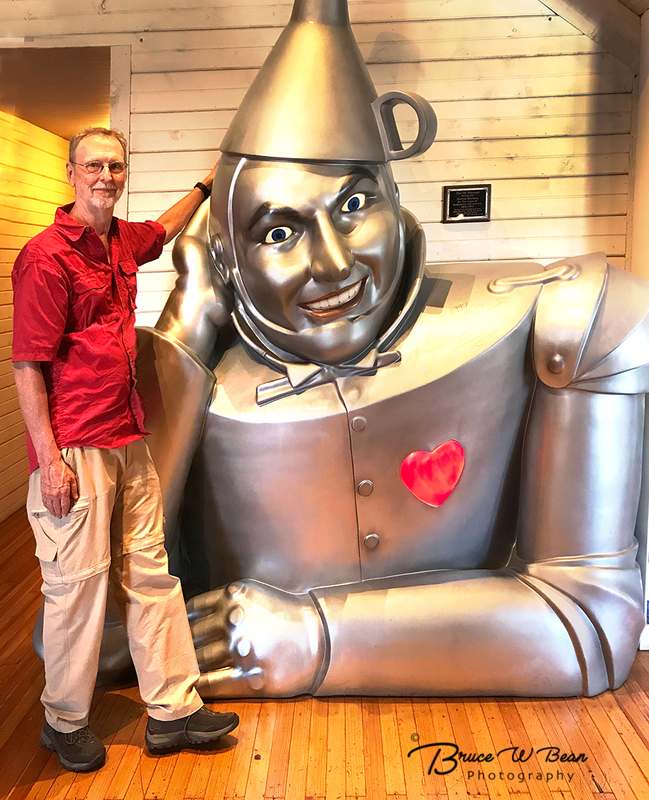 For me it was great to reconnect with my old buddy – The Tin Man. He seemed somehow a bit larger than I recalled however ………. 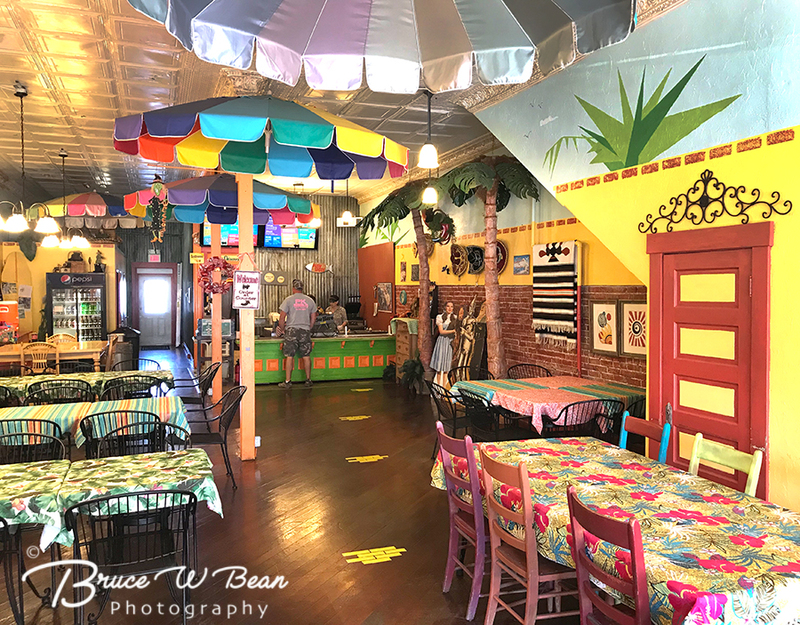 Toto’s Tacoz has a bright and airy interior with a design suggestive of a Mexican Patio. I suppose there must be Mexican food and Mexican patios in The Land of Oz. Right? Plated Taco at Toto’s Tacoz! There’s something new in Wamego – The Land of Oz this year. The town is full of Totos – colorful statues of Toto that is. 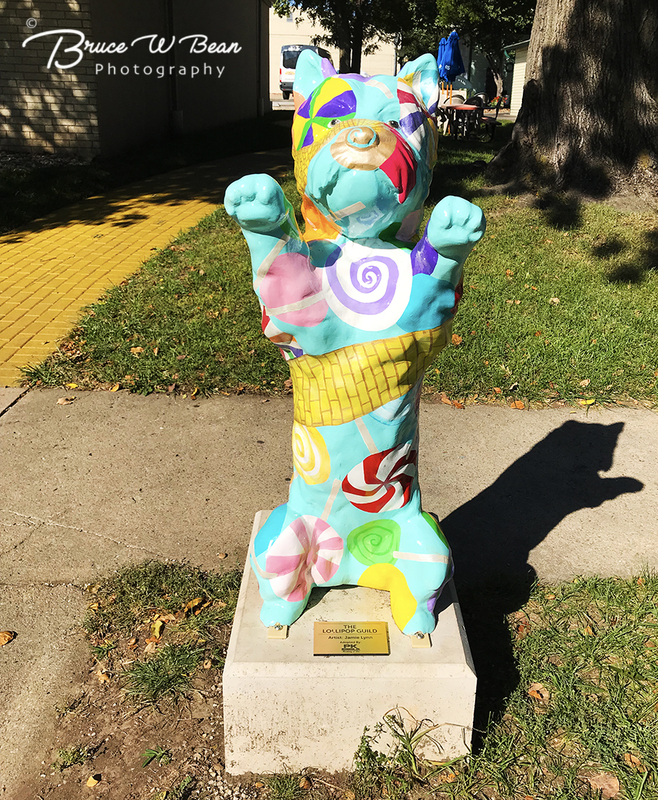 The Totos are the result of a very interesting community art project / fund raiser held earlier in 2018 – “Totos Around Town”. The project was similar to the “Cows on Parade” community art project held in Kansas City in 2001. 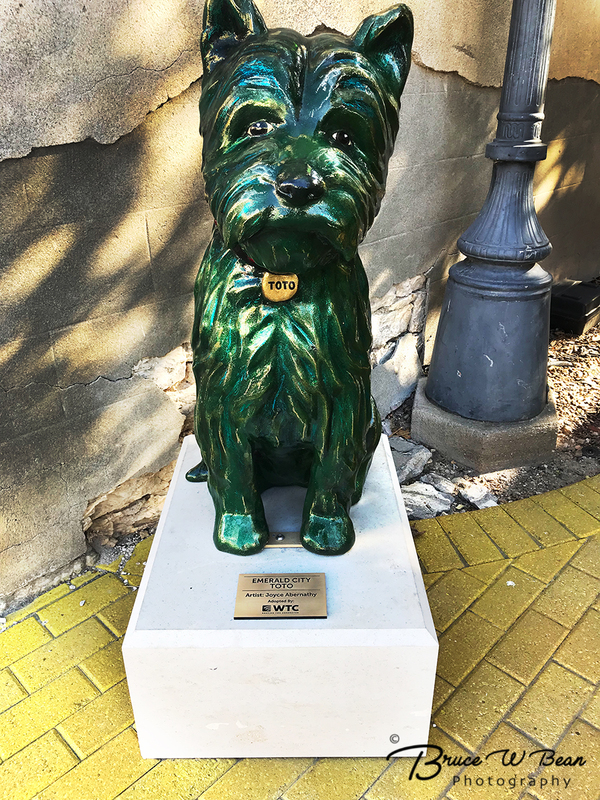 In Wamego, local artists designed and decorated sculptures of Dorothy’s well known and much loved dog Toto. Fifteen different Totos were created in all. Local organizations then “adopted” the Toto of their choice after which each was installed in a public location in Wamego. 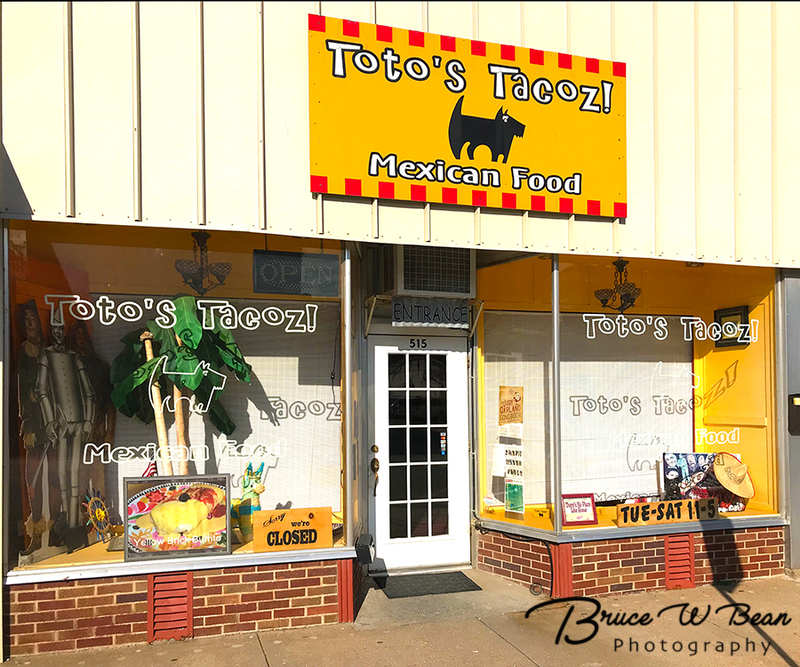 Today Wamego – The Land of Oz is truly a Town Full of Totos. 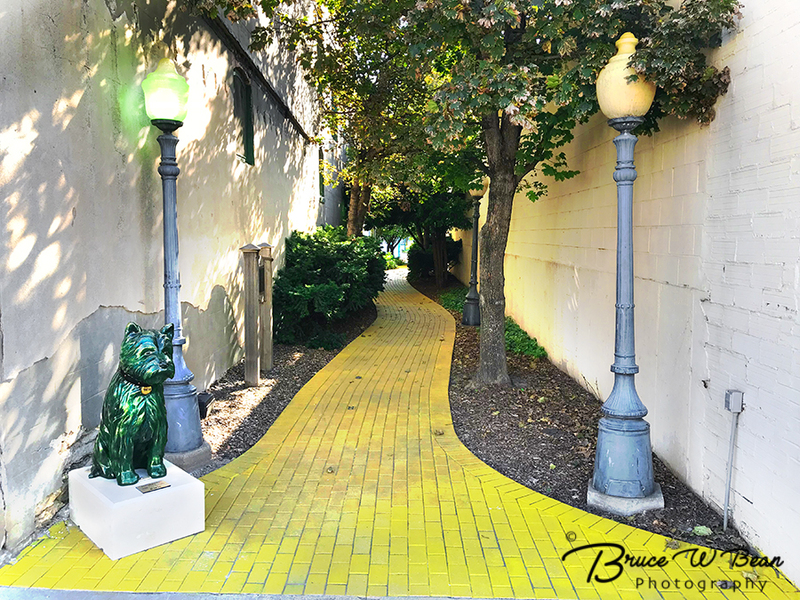 The Emerald City Toto stands guard at the entrance to The Yellow Brick Road on Wamego’s main street. 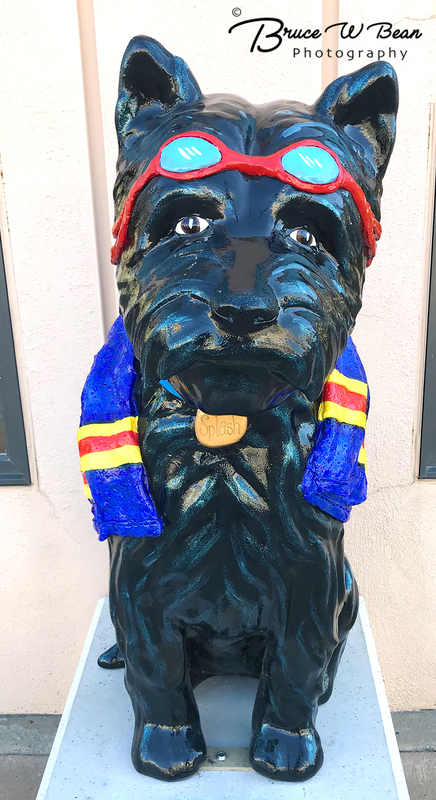 This colorful Toto, titled “The Lollipop Guild” resides at the “other end” of The Yellow Brick Road outside the Friendship House restaurant on Ash Street. All decked out and ready for a dip in the pool, this Toto – titled “Splash” – keeps visitors company outside the Wamego City Hall. 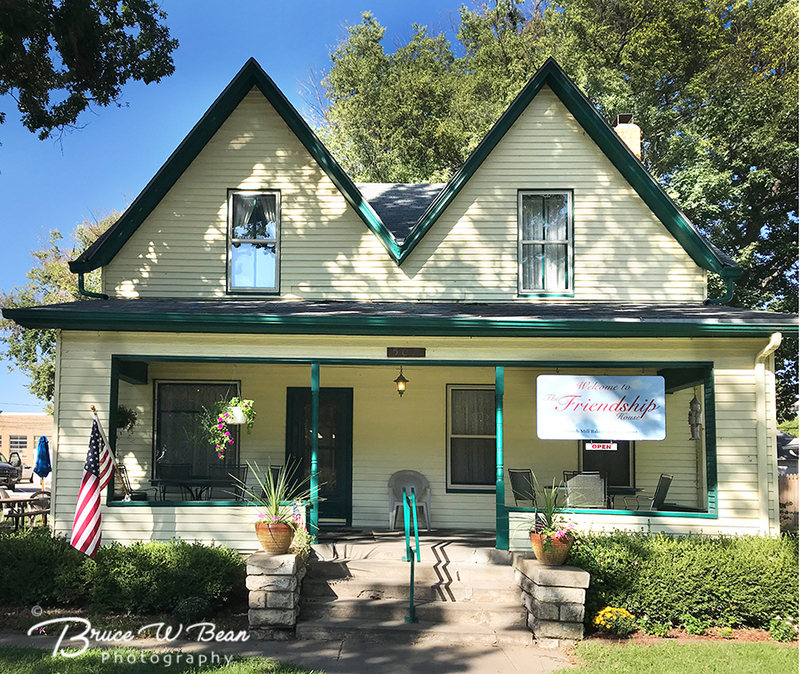 The next time you visit the State of Kansas I hope you will consider venturing beyond the Interstate Highways and sample a taste of Off The Beaten Track Travel. 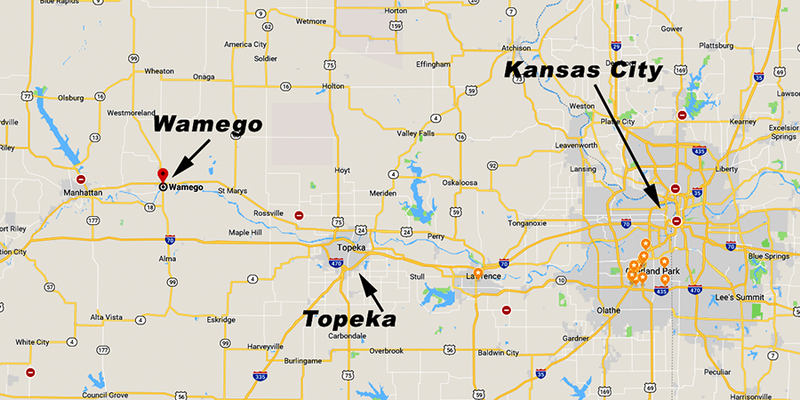 If you are a lover of The Wizard of Oz, or if you are just a wee bit interested the timeless story of Dorothy and her dog Toto, I suggest you pay a visit to Wamego, Kansas where you will find a variety of fun and interesting sites related to The Land of Oz. 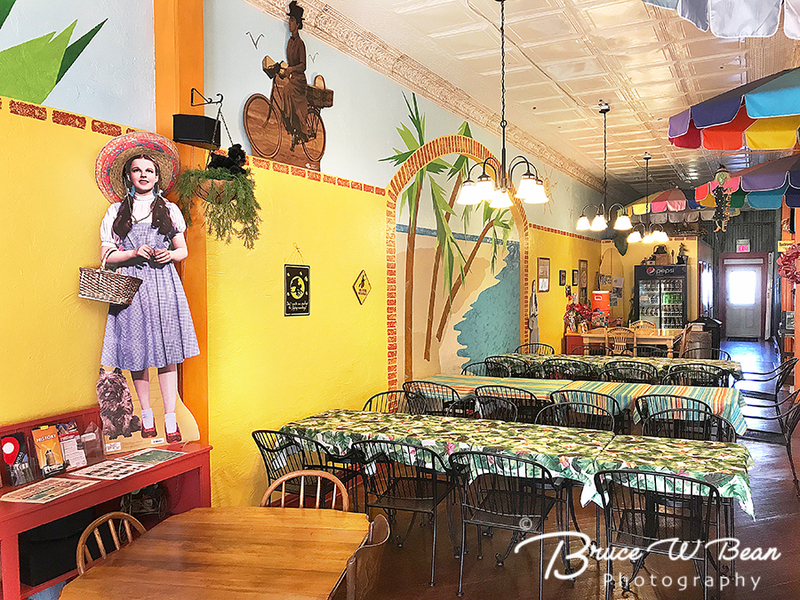 Visit The Land of Oz (aka Wamego, KS) ………… And Enjoy the Adventure!